The Atkins office and studio facilities have been designed to be modern, affordable and with community in mind. Individual spaces are available in sizes from 150sq. ft to 6,000 sq. ft, catering for small and growing companies from many different business sectors and can accommodate a variety of needs. 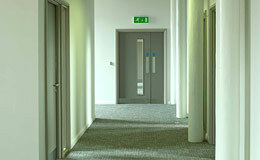 The serviced offices offer a modern, professional setting in keeping with the listed building. They are truly unique spaces, exclusive to Hinckley. Each area is equipped with its own kitchen with instant hot water. The Creative Business Centre staff are on hand to support you, receive your clients and handle your post. The Atkins? business grade internet connection and telephony is through leased line and carries telephone, fax and broadband through to individual office spaces and studios. It's fast, available, and secure - we are very security conscious and have a dedicated Firewall system in place to protect from outside IT security threats. Our networking and IT is all expertly managed by Midland Networks.